Even in winter, but of course especially in summer, a good salad is a treat for body and soul. And, while specialty salads—from a fresh sliced tomato with a little chive, parsley, olive oil, and vinegar to a beet-and-walnut salad—are many and pleasing, lettuce remains the bedrock of the salad-lover’s crops. But there are lettuces and there are lettuces…. Everyone recognizes these, familiar from supermarket shelves and cafeteria sandwiches. Curiously, the type is quite modern, having been developed only a half century or so ago. Compared to all other lettuces, they require more growing space, have longer growing times, are more likely to bolt, are more susceptible to pests and diseases, have less nutritive value, and—by general agreement—have notably less flavor; naturally, they are America’s favorite kind (though not the rest of the world’s). This is a type known since, at the very least, Roman times. It achieved fame in America with the popularity of the ”Caesar Salad”. 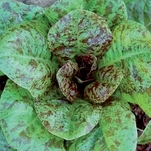 It has a more distinct and distinctive taste than most other lettuces, a very faintly bitter quality typical of flavored salad greens. This wonderful type is scandalously unknown in the U.S. It is perhaps the hardiest of all lettuce types, withstanding summer heat excellently and, by most reports, winter cold as well. Moreover, many think it the best-tasting type of lettuce (sounds a no-brainer, doesn’t it?) On the whole, the type is perhaps best described as “semi-heading”—it doesn’t form a true head, but is not looseleaf either. But individual varities are fairly variable, some heading more distinctly than others. These heat-hardy and gorgeous leafy rosettes are as good eating as they are delightful to look at. They are also sometimes called ”Boston” or “limehead” lettuces. Smaller ones are often used entire as one-person salads (they go wonderfully with a few mushrooms and a simple vinegrette). They are the most popular type in Europe. A type which scarcely needs explanation. Within each broad type there are numerous variants, but we like to think of each as being divided into two sub-classes: “green” and “red”—where “red” rarely means more than purple-tinged or bronze (as with the “red” Sierra Batavian pictured above). With some moderate care in the handling of our growing area—as described farther down this page—one should be able to grow lettuce all the year round. Lettuce is a cool-weather crop to begin with, and is pretty cold-hardy. While it certainly can’t grow out in the snow, only modest aid should be needed to keep it going. 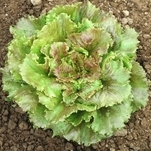 More difficult is summer growing, as lettuces notoriously bolt (go to seed) very quickly in hot weather. The answer there is (we hope and believe) modest protection, such as partial shading, but first and foremost careful selection of cultivars known to be heat-resistant. A great help here are the results from the Colorado State University’s Lettuce Bolting Resistance Project. We don’t have to rely on seedmen’s claims or individual anecdotal accounts: we have careful, methodical trial results available. The Batavian lettuce varieties outperformed the other varieties of lettuce by far. They did not bolt all season long, even in the warmest days…The Butter varieties also performed well. The best Batavian types for summer uses seem to be green Concept and red Cardinale. For butterhead types, among the best green types is good old Buttercrunch, while the choice for a red type seems to be Bronze Mignonette. Though seed houses make much of certain “cold-hardy” winter lettuces, in truth all lettuces are, by nature, fairly cold-hardy. Rather than shop for especially cold-hardy types (and thus have to have two sets of lettuce seeds, one for hot and one for cold), it makes more sense to try to ameliorate winter growing conditions, something we discuss a bit farther on. Curiously, Batavians, so good in heat, are also pretty resistant to frost, as to a fair degree are butterheads—so one needn’t look for special varieties of those types other than the ones already discussed above under “Summer”. But if your fancy for lettuces is insufficiently satisfied by Batavians and butterheads, in cooler weather you can mix in Romaines and even, if you like, a crisphead. For Romaines, your best bets are probably those same ones listed above with summer lettuces: green Jericho and red Cimarron. If you want to go a crisphead, the above-cited Summertime seems a good choice (depite the name). For loose-leaf lettuces, you’re on your own, as we see no point to them with all the other more interesting types available. 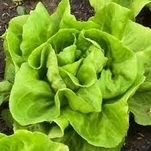 In spring and fall, lettuces can be grown outdoors with no special considerations. But if we are to succeed in the cold of winter and the heat of summer, we need to take some measures. As we said above, lettuces are by nature cool-weather crops—they supposedly can withstand air temperatures down to perhaps as low as 20° F., so in a region where our average coldest overnight low is 15° F., we don’t need measures so drastic as an actual greenhouse. There are all sorts of “tunnel” and “hoop” systems, of varying degrees of complexity and sophistication (and cost), or you can fake it up on your own. Fortunately, lettuces grow pretty close to the ground, so plant height is not an issue. Another helpful trick is to place transparent quart (or liter nowadays) soda bottles filled with water in among the plants; those will heat up in the sunny day and release the heat at night (a poor man’s version of Walls o’ Water, plus it doesn’t surround the plant). To mitigate the warmth, the simplest thing is to provide some shade. A crude way is simple latticed slats set up on the south, east, and west ends of your greens-growing bed. Or you can get fancier by putting up (in the same places) sunshade fabric, of the sort used on house outsides over windows in the summer; or perhaps plastic window-screen roll (fairly inexpensive) would work. If you get relentless sun, make the east and west end coverings solid. We will take it as an assumption that by the means described above, we in this climate (and anyplace the same or warmer) can be growing lettuces throughout the year. To simplify matters, we will also assume that each lettuce will be taken as a whole when ready, though in reality some are “cut and come agin” types from which we take leaves without pulling the whole plant; the idea is just to get a grasp on numbers. As you see, the warm-weather types are distinctly earlier than the cold-weather types. (Whether the same type will grow differently in warmth and in cold, we just aren’t sure.) Thus, in warm weather, where the average maturity time of the lettuces you are growing is more like 7 weeks (49 days), 28 heads may be a bit much: the reckoning would only suggest 24 heads. But a little extra does no harm, and it might well be that you want more than a head every other day in warm weather, when salads are especially attractive. As you go along, play it by ear and your developing experience; before long, the flow of lettuce will become fairly steady. Though many always do lettuces from transplants, it is not problematic to direct-seed for most of the year. The limits, in terms of soil temperatures, are not below 40°F. and not above 80°F. Those are the limits: is is better practice to limit direct seeding to a soil-temperature range of 45° to 75°. (You do have a soil thermometer, yes?) If your soil temperatures seem en route to going outside that range, switch to starting and transplanting seedlings—but remember that you need to be looking ahead on that temperature by the average seeding-development time, which is typically something like 3 to 4 weeks; just subtract the seedling-growth time from the listed “days to maturity from direct seeding” figure to see when to start seedlings. From seed sowing to germination is around 7 to 10 days. The first leaves to show are the plants’ “baby teeth” (cotyledons), and will soon be followed by true leaves. When the seedlings are showing a set or two of true leaves, put them into the peat (or cow) pot you will transplant them in, wait a week or two, then harden them off for two or three days, then transplant into their final home. Space lettuces in one-square-foot spots. Keep them watered well and, perhaps above all, regularly: irregular watering may be worse than scanty watering. Pick lettuce when it looks ready. Grow enough that you can afford to pick when the individual plants are of a modest size, lest you run the risk of having them bolt on you. Many leafy kinds can be harvested a few leaves at a time, which they will then grow back—what’s called “cut and come again” harvesting. All the lettuces are from the Asteraceae (formerly Compositae) family, the asters, which includes many edible greens and some edible roots. There are today literally thousands of different cultivars of lettuce—all sprung from ancestral wild lettuces that grew (and still grow) in Northern Europe, Asia, North Africa, and even parts of North America. There is good evidence that some sorts of lettuces were being cultivated in Egypt as early as 4500 B.C. Certainly the Babylonians were cultivating it by 3,000 years ago, and the Chinese may have started growing it before them. Herodotus tells us that lettuce was served on the tables of the Persian kings of the 6th century B.C. In the 5th and 4th centuries B.C., other great Greek writers described and praised its virtues. The Greeks called it tridax, the Persians kahn. The plant’s modern “scientific” (Latin) name, Lactuca, is derived from the Latin root word lac, milk; our English word “lettuce” derives from the French laitue, also meaning milk. That, obviously, is because the plant has a heavy, milky juice. The juice, or sap, was long thought to have significant medical properties: Hippocrates mentions lettuce sap as a medicinal, supposed to induce sleepiness. As in the development of the cabbages, the primitive forms of lettuce were loose, leafy, and sometimes “stemmy” types; the looseheading and firm-heading forms occurred much later. Firm-heading forms had become well developed in Europe by the 16th century, but just when they were first developed is unknown. The oak-leaved and curled-leaf types, and various other colors now known, were all described in the 16th and 17th centuries in Europe. Columbus evidently carried lettuce to the New World, for its culture was reported on Isabela Island (now called Crooked Island) in the Bahamas in 1494. It was common in Haiti in 1565. When it was introduced into South America is not known, but doubtless it was soon after the Europeans arrived; it was under cultivation in Brazil before 1650. Lettuces are today used almost exclusively raw, but they can be cooked—indeed, lettuce was normally eaten cooked till the time of Louis XVI, when the Chevalier d’Albignac famously dressed raw lettuce with a vinaigrette. Think lettuce, for all its virtues, is boring? Check out The Lettuce Ladies (this being the 21st century, female readers can check out The Broccoli Boys). It was last modified on Thursday, 31 January 2019, at 03:03 EST.